One of the most popular players modules for Joomla. Player became famous because of the possibility of creating your own skins, ease of use and powerful features that allows you to play music in MP3 format. A Pro edition of the module meeting most of the user requirements for music playing from within the web site. Check for conflicts with jQuery. Automatic start of sound tracks. One button is a setup when activated allows you to reduce the player to a single button. When you click on it, a full-function player pops up. Reading of ID3v1 and ID3v2 tags from mp3 files. Native support for html5 (playing without Flash plugin). Stream audio playback for radio broadcasts. 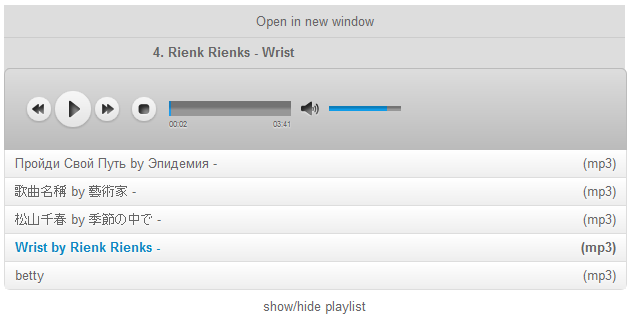 Music playback from remote web sites. Player CSS skins allow you to completely change the player design. Additional skin sets installed by their simple copying into your Skin folder. Selection of the installed skins is made via the player module settings. Player settings cookies storage for your web site visitor. Next time the user visits your web site, the player will use the settings the user configured himself. No hyperlink to joomline.ru web site. Support the ability to accommodate multiple players on the page. To create "music" directory in a site root. To copy mp3 files in "music" directory through FTP the manager. Removed dash after the name of the artist. Bugfix not correct the start time of the track. Full refactoring of the module. The correction of errors found. Solving problems with Joomla 3. Update library for reading tags of mp3 files. Resolved conflicts with mobile devices. Added option to display the playlist. Added option to display a marquee. Added the ability to open multiple windows player. Added the ability to accommodate multiple players on the page.